Expensive displays: R they really needed for Illustration? I am looking around for a new display. I use my computer (as most people in here) as a tool for illustration and comics. My stuff, 9 out of 10 times are destined to be printed in offset, and being a freelance illustrator, my work is rarely printed at the same printer, which means that getting involved with color profiles to achieve correct results with each and everyone of them, is hardly realistic. (like Eizo's flexscan for example) are a little over a 1000$. Bottom line is. I am confused. I really do feel strongly about color accuracy in prints, and I don't mind paying extra for proper hardware, if that means decent results. But there is not a firm belief out there in the real world, that expensive equals best results. I'd love to hear what's your preference on the matter, or some thoughts on the subject if any. The short answer is yes. Having a good, color-correct screen can make life a lot more pleasant for creative work. You can spend a lot less than two grand on a good monitor that can be calibrated. My LaCie 324 was around $900, plus the colorimeter for another couple of hundred. And there are even better deals to be had - I recall some of the NEC screens costing in the $3-500 range getting very high marks from color pros (from my research about a year ago). I know of at least one design studio here in LA that uses Dell monitors because they (once upon a time anyway, you'd have to re-confirm this now) use the same LCD panels as the Apple screens - which were very good for the money at the time. Hardware calibrate one of those and you should be good to go for your purposes. But hardware calibration is strongly recommended when possible. If you don't think you can afford the expense maybe you know someone with a colorimeter that will let you borrow it to set a profile for your new screen. Last edited by Scruffy on Thu Jan 14, 2010 4:13 pm, edited 1 time in total. I 'll check them out. Old school CRT monitors have accurate color, whereas most LCDs do not, so I just checked my colors on my CRT while working on the LCD and my printed work came out looking fine. Be sure to run Adobe Gamma on whatever it is you're working on. That simple calibration will do wonders for your value contrast. By the way, I would highly recommend getting a Cintiq if you're considering getting an expensive color-accurate LCD. The extra money for the screen tablet is well worth it for increasing production speed and effectiveness. The color accuracy is a HUGE bonus. In fact, according to this article (http://www.moosepeterson.com/digitaldar ... q21ux.html) the Cintiq uses the same LCD panel as the Eizo 220, which is pretty bloody impressive if true (and help justify the cost, certainly). I guess it should be mentioned that we're talking about the full-sized 21UX, and not the 12 (which uses a laptop-type LCD and is just not in the same league, color-wise). I haven't heard before that it performs so well as a display. I am really comfortable with the intuos tablets, and trying a cintiq for a little while, didn't feel quite so smooth or similar. It's not like a tablet, and it's not like the real thing either.There is probably an adjusting period needed, before you can work smoothly with it. Then again, It was exactly the same with the tablet the first time around. luxury that doesn't make a lot of sense. Knowing that it performs so well as a display offers a new perspective but still, if you are not planning on working with everything it has to offer, you can't really justify the price tag. Thanks again for your input. It really gives me a reason to consider it again it as a valid option. 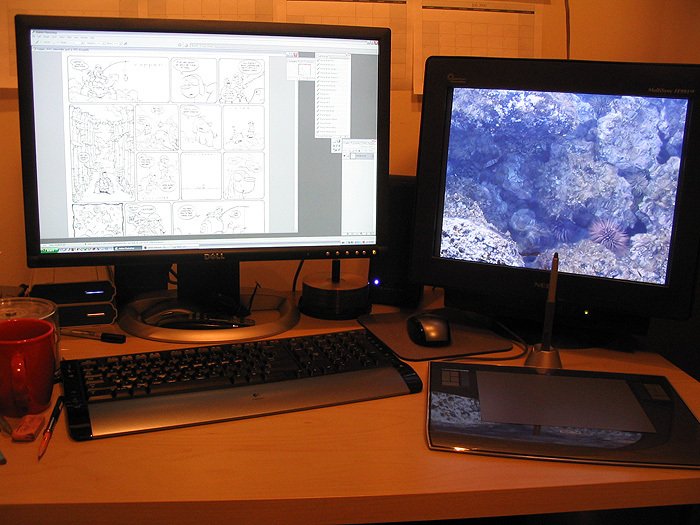 Scruffy: I seriously doubt that wacom would use any part of eizo's display in Cintiqs, and keep quiet about it. They would probably plaster it all over their site and promotional videos, considering the high profile that Eizo has when it comes to quality displays. Maybe they are refering to similar technology (panel types etc.) which is not all that impressive by itself. What makes the Cintiq unique is that it is a LCD-tablet monitor that can be truly calibrated. [T]he 21UX ... achieves calibration like no other LCD (except the Eizo 220 which uses the same LCD panel). Kostas, I actually still use the tablet about 1/4 of the time I work digitally. While I still prefer to paint straight to digital with a tablet, the Cintiq's ability to speed up our graphic novel coloring process by more than double the speed is really hard to overlook. It also allows me to work for longer periods of time without feeling the mental fatigue that often comes with painting on a tablet. Something about painting directly on the screen, even with the slight lag, really helps my brain deal with the process a lot better over long periods. I went back and forth between the tablet and Cintiq during the production of Amulet 1, and it became very clear that the Cintiq was a better tool for painting comics. The tablet remains a better option for abstract painting (where you aren't having to color within the lines) Anyway, I just wanted you to know that I was pretty skeptical about spending so much money on one at first. I even regretted it after the first week because I didn't see instant results (I had to get used to it). Now I have three of them. I can see your point. Doing linear stuff, (or paint within constrains) needs a precision that comes natural when you are working on a cintiq, as opposed to a tablet, where lines are like a constant little guessing game. or a game of trial and error, undoing 5 lines before ending up with the one you keep. I can understand that It adds up. It's exhausting after 10 hours working straight. Like I said, I 'll be giving it some serious thought in the following week. examine the pros and cons carefully.